We have a very good visit yesterday at the Baylor Feeding Clinic for Bennett's evaluation. He was evaluated by a Nutritionist, a Speech Therapist and a Occupational Therapist to see which of their three programs (day, outpatient and inpatient) for which he qualifies. It is through this evaluation that we were able to determine from the evaluation is that there are three steps to weaning a child off the g-tube. The first step is traditional speech and occupational therapy. The Baylor Feeding Clinic calls this their "outpatient program." This is essentially what we are already receiving through our at-home therapy. A speech and occupational therapist currently visits Bennett twice per week to work with him to lessen his oral sensitivity and encourage him to explore new textures of foods. The second step is speech and occupational therapy with the use of behavior modification during an intensive 5-week Day Program. This program requires that we live in Dallas for 5 weeks and visit the clinic from 9-4pm every day. 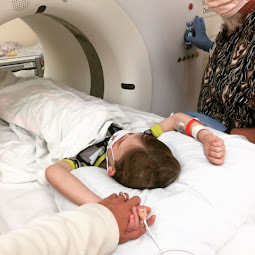 The goal of this program is to begin to transition Bennett from getting most of his calories from his feeding tube to getting most of his calories from oral solids and liquids. Much of this will be done by teaching us, the parents, how to offer the therapy when the professionals aren't around. The third step is using speech and occupational therapy as well as behavior modification during an equally as intensive 5-week Inpatient Program. This program will require us to move to Dallas and live in the children's hospital for 5-weeks. It is our hope that by the end of these 5 weeks, Bennett will be fully independent with his eating of solids and drinking from a cup! We will not have to go to this step if he can become independent with the Day Program. But this is the ultimate last step of the process. We learned some great information while we were at the evaluation. Some information was encouraging to hear. Some information was disappointing to hear. It was disappointing to hear that, due to age, Bennett actually does not qualify for their day or inpatient program yet. Apparently they forgot to mention to us over the phone their highly acclaimed behavior modification program (which is used in their day and inpatient programs) cannot be used until the patient is 15-18 months. Since Bennett is not yet a year old, he is still too young for them to use much behavior modification to encourage eating. So, it seems, they really can't help us much there...yet. However, since the waiting list for their Day and Inpatient programs is currently between 6-10 months, it is actually best that we went ahead with our evaluation now. Our hope is that by the time our name comes up on the waiting list, Bennett will be the proper age and will be ready. It was encouraging to hear, though, that Bennett merely needs to be able to eat one ounce and drink one ounce of food (as well as be the proper age) to begin the Day Program. This is encouraging because we are not far from having Bennett be able to do both. At this point, we just need to work with Bennett's current in-home therapists to help Bennett be able to accept more volume orally. Our hope is this can be done within 3-6 months. 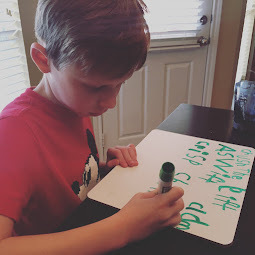 At this point, Bennett's current in-home therapists are planning to speak with the Baylor Feeding Clinic to make sure they can provide a form of "Outpatient program" that we would get with the Baylor Feeding Clinic if we lived in Dallas. And then, we will keep in touch with the Baylor Feeding Clinic over the next few months to monitor Bennett's progress. We are already so thrilled at the progress Bennett is making and expect good things in the future! We are so happy to feel like we can now see an endpoint to Bennett's feeding issues, which brings us much peace and hope. wow, so exciting! it's amazing to know such specific and intensive programs are available to you guys! Bennett is doing amazing with his eating these days!! We are VERY happy with how he is doing. He has few, if any, residual texture issues. 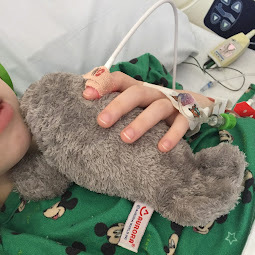 In fact, he prefers to take medicine by mouth, rather than his g-tube and recently began swallowing pills (something many adults struggle to do). He doesn't have a huge appetite but eats regularly - usually breakfast, a snack and either lunch or dinner. We still use his g-tube to supplement his need for nutrition. But we have not had to make any adjustments to his g-tube supplement since our time at Baylor. If anything, Bennett has simply begun to eat more and even more exciting has begun to enjoy food more. We no longer use therapy. So, we have been very happy with his progress. I hope you have a good feeding assessment and your baby boy can benefit from the experts at Baylor. I will tell you that each child that comes to Baylor comes with their own unique issues. We certainly believe Baylor placed Bennett is a very good place to succeed. But it's also hard to know exactly why he struggled in the first place. Bennett recently underwent extensive dental work that we believe has also benefitted his eating (maybe he had one or more cavities that caused him to struggle?). So, I don't want to give false hope to families with children who have intensive oral aversion. But what I can say is that we believe had Bennett not gone to Baylor, there is a very good chance he would still be struggling with his eating issues. 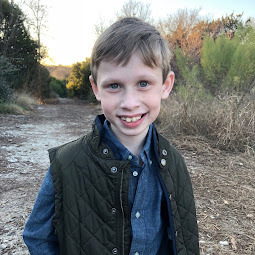 Not only did Baylor give us education on eating issues and a way to deal with them, they gave us hope and a community of people who genuinely care about seeing our son succeed. I HIGHLY recommend Baylor and would be happy to answer any more questions you might have. All in all, I think your own feeding assessment will give you more indication of how it will help your 19 month old. I think the younger kids get help, the better. So, good luck and please let me know how it goes!! It's a beautiful thing when a child who wouldn't eat anything asks for a cookie! :) I'll be thinking of your family this March!! The Almost Best Birthday Present! Another visit to the doctor today.